This post is about monitoring metrics to get results EVERY time. – setting up a Facebook fanpage. – Measuring Facebook engagement: What is good? Article source – Is blog and Facebook engagement obsolete? 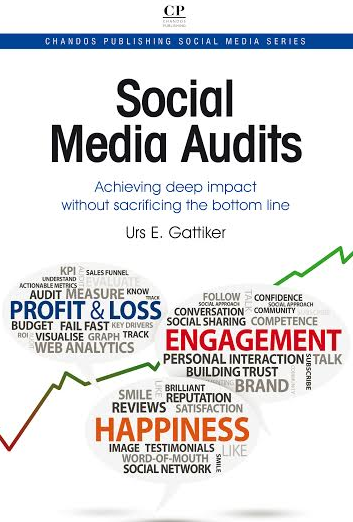 These days, everyone focuses on engagement and tools to improve customer relationship management using social media. In July 2009 I stated that Twitter is really not scalable and most of us will not gain clients through such interactions. Engagement can still happen in social business, but you have to go beyond the numbers to figure out what it means in the context of your organization. 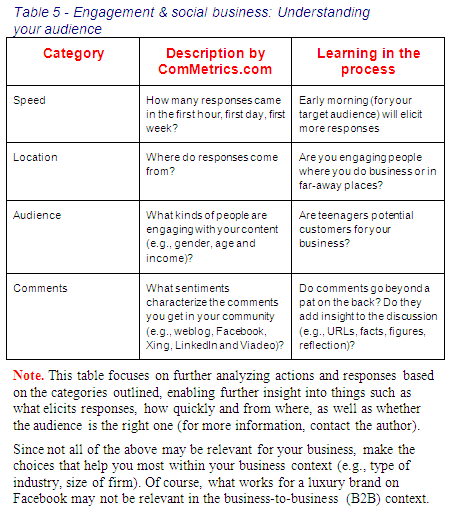 The table below suggests what to look at when getting feedback in the form of a Facebook Like, blog post comment, tweet or re-tweet of something you shared. 1. The more difficult the subject of a post, the fewer people will add a comment, so follow the KISS principle whenever possible. 2. The longer your post the fewer people will read it, so try to explain calculus in 140 characters or less. 3. Playing devil’s advocate, and being counter-intuitive increases the number of audience responses, so provoke without upsetting. 4. Talking about a subject your audience craves knowing about helps, so discuss the latest and add a twist. 5. People increasingly get their information via smartphone or iPad, so make sure the headline and first two lines of each post entice readers to reach the finish line. 6. Unless all this engaging helps improve your bottom line, it is just a hobby – engage to help people develop enough trust to be willing to do business with you. In spite of that, your context may be such that provocation fails. Your clientele might be so conservative and cautious (remember your local banker) that they will rarely if ever risk commenting on something you posted. In this case, the 900-98-1.5-0.5 rule applies, which states that maybe 1.5 out of every 1,000 people will click Like on Facebook and only every second person will take the time to write an insightful comment. If you do better than that, congratulations! In light of this, who are your clients? What kind of image, brand and reputation are you or your organization pursuing (e.g., being hip and part of the zeitgeist or trustworthy and conservative)? 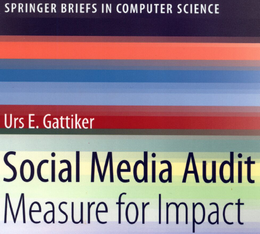 This will determine what your posts look like, and as the research paper below demonstrates, fewer close social ties may be more helpful in fostering engagement and building relationships than many weak ones. 1. How has engagement increased your product sales or donations to your cause? 2. Have you stopped engaging on Facebook? If so, have there been any consequences? 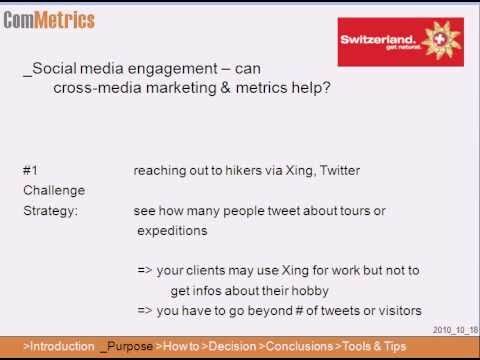 Include the word ComMetrics in your search query to find more information about customer engagement and relationship management and watch the video below. Interesting post!nnWhat if that is all I said?nnIt’s true and says that, but nothing more. It raises my visibility but not my credibility. And, I am not sure that people who make one line comments understand that. The blog owner is establishing visibility and credibility by writing the post. The reader of the post can do the same should they desire. But there is more, I suggest many people don’t write more because they fear appearing stupid or being ridiculed by others later on.nnSo let’s get on with the questions posed…nnFor me, engagement is about positioning rather than promotional pieces. And, this approach has proved very successful for me. I say that from testing both types of material. The promotional material got no additional airplay in the social media space. nnProspects arrived through email asking for a chat. That lead to a high conversion because I realized that had already purchased in their minds and were just completing sale. Of course, the problem is that you have no control over the volume nor the frequency of this. Sometimes it was a few a week then nothing for a few weeks. nnWhat I’ve also found is that engagement, although it is better to be frequent, doesn’t have to be. People will still listen and comment when you post if you have that positioning, that credibility in the market.nnHaving been through a major change in my own business, I have a couple of facebook pages that are still up but nothing happens. What has happened? People still pop by but they don’t do anything. Why? Well, I guess they see the “tumbleweed rolling across the page” and say to themselves that nothing much happening here and go away.nnThat’s OK providing these pages aren’t going to be important later… it’s a lot harder to recreate credibility than to create it.nnSo, if get into social media, do it with a plan of where you want to be and how you are going to measure it… otherwise you could find that you have been playing a game with high stakes – nYour Visibility and Your credibility nnOnce tarnished, much harder to recover. There are lots of examples! Karen, very thoughtful feedback indeed. Thank you!nnI am smiling and wondering…. engagement is in part promotion but there are different ways to skin the cat. For instance I can try to:nn- Pay a person to walk up and down main street carrying a sandwich (movable) sign praising my product, or n- Writing blog posts and share content that potential clients value greatlynnIn both cases it is about selling but one uses different ways to promote the product and packaging.nnOf course, credibility or trust gained is hard to come by and I am not sure if the person walking down the street praising my product will do as well as valued content that I create or offering people to read something and then talk to me for free for 15 minutes as you Karen suggest above.nnSocial media or advertising can help to improve one’s positioning and credibility in the market, agreed. But ultimately it is all about getting people into the sales funnel…. one way or the other.nnOf course this can happen in various ways and people may be referred to your company via their friends that attended a webinar or saw you give a speech at a Rotary luncheon. nnWhat is ever more becoming clear to me is that it is a marathon and not a 100 m dash :-)nnKaren, thanks so much for sharing. Previous post: How dead is SEO marketing?